Australia’s cultural, social and political history is entwined with Britain’s. We share a language, the Westminster democratic system, the common law and a respect for diversity, individualism and freedom. Australia’s modern incarnation was defined by British colonisation. As former Australian prime minister Tony Abbott put it last week, during a discussion of Anglo-Australian trade relations at the UK Conservative Party conference, ‘Once, you exported people to Australia, of course… chosen by the finest British judges’. Today, Australia and the UK continue to have particularly strong ties in intelligence and international relations, but the UK’s decision to join the European Economic Community in 1973 put a strain on our close friendship. This is why Australia is excited about Brexit. It is an extraordinary opportunity to right a historic wrong, and rebuild our relations, both economic and cultural. Many pessimists have pointed out that Australia’s trade with the UK is very small – minimising the importance of any trade deals. Indeed, Britain is only Australia’s 8th largest export market. However, this focus ignores the reason why Australia-UK trade has declined – Australia’s lack of access to the common market. Australian businesses cannot compete on an equal footing with European businesses. Take one industry: butter. Older Britons might remember that until the mid-1970s Australian butter was a significant presence on UK supermarket shelves. But after Britain joined the EEC, Australian butter exports dropped by more than 90 per cent. Or take the case of apples: exports declined from 86,000 tonnes in 1975 to 27,000 tonnes in 1990. Similarly, before the UK’s membership of the EEC, about a third of Australia’s sugar exports went to the UK. This market virtually disappeared overnight. 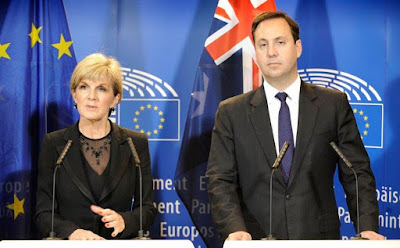 Australia began negotiating a free-trade agreement with the European Union in 2015. Sadly, however, talks have stalled due to Italy’s protest about Australia’s anti-dumping duties on Italian canned tomatoes. As a consequence of a completely irrelevant delay, Australia and Britain are missing out on the mutual benefits of freer trade. Our passion to rebuild historic relations with the UK, playing off our complimentary economies, is the reason why we are the first country in line to sign a deal with the UK. We’re pretty good at trade agreements, too, having completed negotiations with China, Japan and Korea in the past few years. There has also been substantial decline in the number of Australians issued visas by the Home Office in recent years. This is not because young Aussies are uninterested in coming to the UK, but rather due to new visa regulations and migration caps. 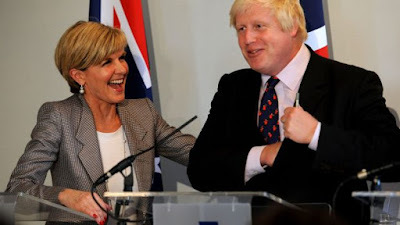 UK foreign secretary Boris Johnson has previously supported a ‘free-mobility labour zone’ between Australia, Canada, New Zealand and Britain. UK home secretary Amber Rudd has since poured cold water on the idea of increasing the number of Australian migrants. But, with negotiations yet to begin, there’s no reason to dismiss the possibility of it happening. The consequences of these trade and migration restrictions are bad for both Britain and Australia. Nevertheless, Australia has flourished since the 1970s, largely thanks to our open economy. According to the International Monetary Fund, we have the 16th highest per capita income in the world (the UK sits at 25), and, according to the World Health Organisation, the fourth highest life expectancy (the UK sits at 20). We are proud of our achievements and are ready to re-establish a strong independent relationship with the UK, one that would be beneficial to both our nations.